Company Overview - Yancheng AST Sporting Goods Co., Ltd.
9YRSYancheng AST Sporting Goods Co., Ltd. 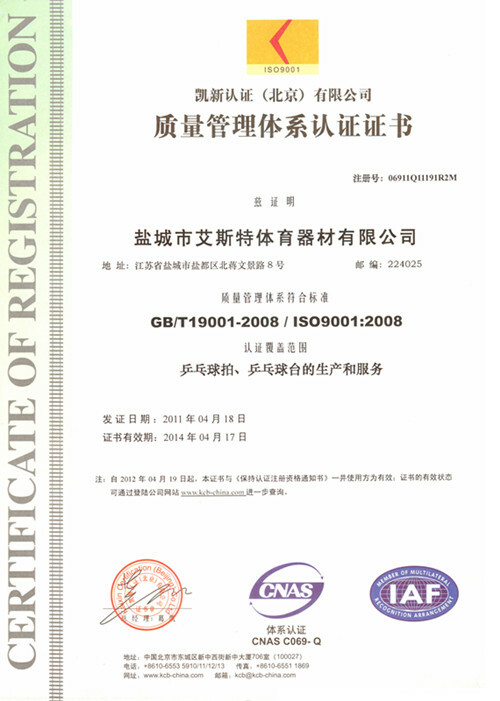 Established in 1998, our company is a manufacturer as well as an importer and exporter. We specialize in producing table tennis equipment such as table tennis rackets, tables, balls. Our products are exported to Germany, France, Spain, Turkey, Australia, Japan and other countries. We have our own well-known brands such as "Yaping" and "Reactor", besides, we are the agent of DARKER and ASICS.Our products gain high reputation from customers all over the world. We do research in our own Developement Center, we have independent intellectual assets and advanced patent technology. Sincerely, we hope to cooperate with every potential customers like you.